Today I received a gift basket. As I was dropping the girls off for preschool (both girls, as in MOTHER'S MORNING OUT, Oh Happy Day), another preschool mom was waiting for me in the parking lot. She heads up a Mom's group that meets at the local Methodist church. I started attending this year on the invitation of a friend, now having a bit more freedom with my time. This week's meeting topic was "The Mystery of Autism" and I'd missed it. We had a plumbing issue arise and the repairman's window of time conflicted. And truly, I wasn't sure how I'd feel in a group of "autism outsiders" discussing this subject as an insider. I can get a wee bit, erm, defensive about it. A bit prickly, I'd say. I'd looked ahead to the week's discussion guide, and it started with an opener that had the moms imagine the limitations of autism, such as only being able to talk about a restricted subject or obsession. Some part of that bothered me. I thought about asking the leader to share from my own experience or just to come up with another entry point into the topic, but I didn't and let the impulse pass. So when my appointment interfered with the meeting, I thought maybe it was just as well. No need to have a cynic in the room. When the group leader approached me today, I offered up my apologies and reiterated my conflict when she handed me a basket filled with cards and "little happies" and told me the group had prayed for me and another mom in the group with a child on the spectrum. I thanked her and we chatted a few more seconds, as I placed the items in the car to take the girls inside. When I got back to the car and began to unpack the basket, I opened up card after card that just encouraged me-- no "poor you, your life must be so hard"-- just encouraged me. From one woman to another, with different experiences perhaps, but many in common: womanhood, motherhood, and following God. I had to text a friend the unexpected surprise (if something happens and it's not shared and photographed, it didn't happen, right? This is 2014). In the text, I summed up my unspoken stance towards receiving someone's generosity: Um, God. I'm supposed to do nice things for others. I'm too competent to receive in return. I believe the deep theological word for this is pride. In the English it's pronounced PRIDE. I don't know how it's pronounced in the Greek or Hebrew. These are the dots I've been connecting lately: At some point in our life, we will belong to a sub-group we wouldn't have picked. Mine's disability. And when we are not in the company of that group, we don't want to be known by that label, in my case, "Autism Melissa". No one wants to be Divorced Jane or Almost Bankrupt Mary. And the trouble with that mentality is if that's how we think we are being perceived, then that will be how we perceive others' treatment of us. Perception becomes our reality even if it's not the truth at all. Obviously, I've read enough Personal Growth and Spirituality books to fancy myself quite the psychologist, but go with me here. 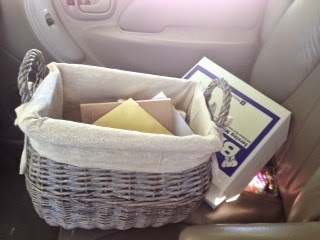 What brought me happiness today was that this thoughtful Basket of Happy wasn't addressed to AUTISM MELISSA. It was addressed to me. All of that to say, I'll be at the Mom's group next Monday, with or without the clogged plumbing. And more open to receive the unexpected.